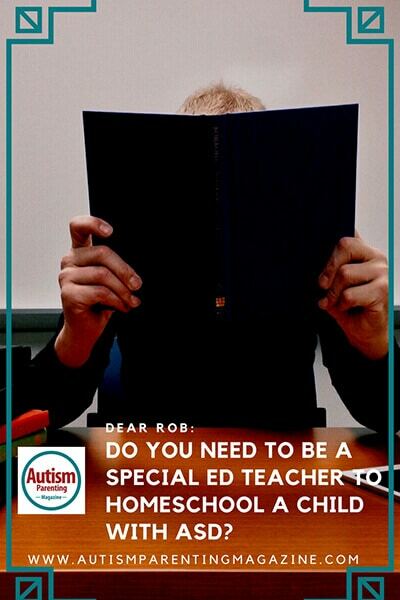 Do You Need to Be a Special Ed Teacher to Homeschool a Child with ASD? I sure hope you are able to give me some advice. My eight-year-old son has autism spectrum disorder (ASD), attention deficit hyperactivity disorder (ADHD), depression, stress, and anxiety. The school will listen, but does nothing to help as far as changing his Individualized Education Program (IEP) for behavior issues. I am doubting myself on the homeschooling because I was told by his psychiatrist that I am not qualified to teach special education to my child. Another doctor, his family doctor, thinks that it will not be good for him because he needs speech therapy which he receives at school. I am stuck between a rock and a hard place. I would love to homeschool him, but I do not want to make the doctor or his psychiatrist and psychologist mad. If you have any advice or suggestions, I would gladly appreciate it. It does not surprise me that your child is diagnosed with autism, ADHD, depression, stress, and anxiety. There are about 25 diagnoses that can be associated with autism. Generally, if we can improve the autism in some fundamental way, the other difficulties improve as well. Your psychiatrist and psychologist are wrong, plain and simple, but they may be trying to protect you from the amount of time and energy you will need to follow through with homeschooling. You don’t need to be a certified special education teacher to teach your child, but you need to submit an IHIP (Individualized Home Instruction Plan) outlining the course of instruction including numerous subjects, some of which may need to be taught by others. Of course, you may combine activities with other homeschooled students. Also, your child is entitled and actually obligated to have services such as speech therapy. You can bring your child to school for these services or you can have a speech therapist come to your home. First, you need to consult with an educator who you trust, preferably outside the school system, so you can get an objective overview of the homeschooling process. When I guide parents in this adventure, my primary goal is for the parent to feel confident and excited in giving the child quality education, rather than feeling undue anxiety. Again, the professionals you are working with may be trying to protect you from a situation that may give you more stress. Next, talk with parents who are or have already done homeschooling for their children. Try to hear a balance of the advantages and disadvantages. If you still feel this is the best option for you and your child, then speak to someone at the school, probably one of the counselors, and ask him/her the procedural questions regarding applying for homeschooling, requirements, etc. Of course, going online for details of the IHIP and other information would be beneficial. Rob Bernstein, an educational therapist specializing in autism spectrum disorders, gives you hands-on suggestions for handling your child’s behavioral issues. Rob uses a cognitive approach to understand what’s underlying in the behaviors, so that the issues can be resolved. He has over three decades of experience working with individuals with challenging behaviors including tantrums, repetitive behaviors, self-destructive behaviors, hitting, cursing, miscommunication and non-communication, school issues, and difficulties relating to others. Rob is also the parent of an adult son who is on the autism spectrum. If you have a question for Rob, please email editor@autismparentingmagazine.com. Rob Bernstein, an educational therapist specializing in autism spectrum disorders, gives you hands-on suggestions for handling your child’s behavioral issues. Rob uses a cognitive approach to understand what’s underlying the behaviors so that the issues can be resolved. He has over three decades of experience working with individuals with problematic behaviors including tantrums, repetitive behaviors, self-destructive behaviors, hitting, cursing, miscommunication and non-communication, school issues, and difficulties relating to others.